Expired medications – are they safe? Are they effective? In Part I of this series, I explained the definition of pharmaceutical expiration dates and ‘do not use beyond’ dates, and how both are determined. Additionally, I reviewed information from the Shelf Life Extension Program database, which led to a temporary Emergency Use Authorization in 2009, permitting the use of certain Tamiflu products (to treat H1N1 influenza) for up to an additional 5 years beyond the imprinted expiration date. Please see Part I of this series for more information. Part II will examine the data regarding use of common antibiotics beyond their expiration dates. Does a can of tuna go bad overnight? What about a bottle of medicine? Common sense suggests the answer is no, but is there any evidence? The primary source of information regarding the prolonged stability of medications comes from the Shelf Life Extension Program database. Rather than discard millions of dollars worth of expired drugs stockpiled for emergency use, the U.S. federal government tested representative lots of selected medications for extended stability. These stockpiled drugs are aimed at emergency use for injuries and infections rather than chronic diseases such as diabetes, heart disease, and asthma. The most useful data for the layman is related to drugs to combat bacterial and viral infections. Of the antibiotics tested, all passed assays for stability, potency, and appearance for at least a year beyond the original expiration date. Of the lots tested, the following had their expiration date extended by the number of months indicated. A summary of the SLEP data is available in The Journal of Pharmaceutical Sciences, Vol. 95, No. 7, July 2006. Liquid preparations may be much less stable, and degrade more quickly if frozen or heated. The Medical Letter advises that “Drugs in solution, particularly injectables, that have become cloudy or discolored or show signs of precipitation should not be used.” For oral medications, color changes may also be related to the dyes rather than the drugs. The primary concern pertaining to eye drops is microbial contamination once the preservative becomes ineffective. Overall then, the concern is not regarding safety, but rather effectiveness. “Many drugs stored under reasonable conditions retain 90% of their potency for at least 5 years after the expiration date on the label, and sometimes much longer,” per The Medical Letter. The SLEP data does not describe testing for any controlled-release antibiotics, such as Biaxin XL and Augmentin XR. Controlled-release delivery systems vary from drug to drug and would require testing not only of the medication itself, but the delivery system as well, to assure adequate drug delivery. Therefore, the regular versions of both Biaxin and Augmentin may be preferable for stockpiling. Essentially the only advantage of controlled-release antibiotics is less frequent dosing. In the case of antibiotics, a 10-25% loss of potency over time may make little difference in treatment, and could be made up for by higher dosing in serious infections. Even now, generic medications are allowed a variance of +/- 20% in terms of bioavailability, whereas brand-name drugs are permitted only a 5% variance. Theoretically this might yield a 50% difference from one generic to another, or from pill to pill. However, in recent studies the FDA states the average difference in absorption between generics and brand-name drugs is only 3.5% (see http://tinyurl.com/kvtaad). Also, generics may not be equivalent in terms of integrity, dissolution properties, or coatings. In the case of generics, “Made in the USA” is probably preferable to those manufactured elsewhere. In my next post I will examine the use of other common drugs beyond their expiration date. 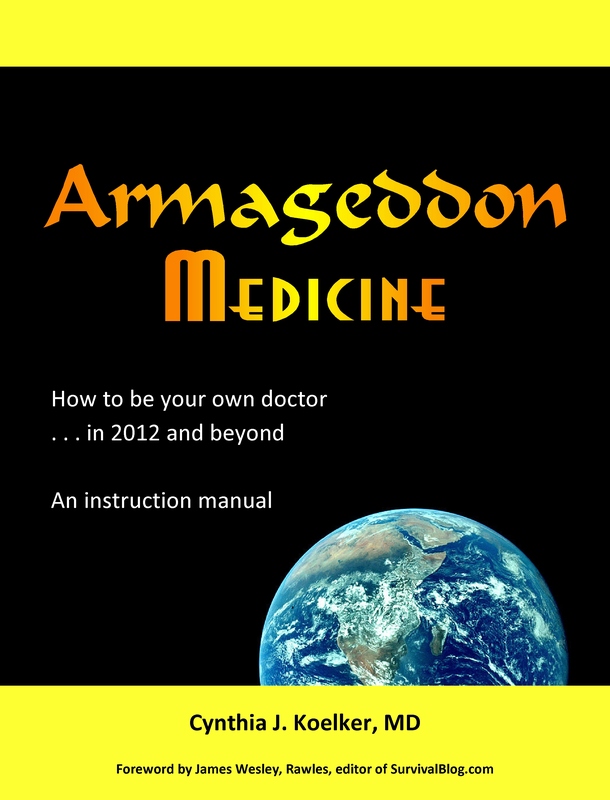 What do Armageddon and health reform have in common? Either way, people need to know how to care of themselves with the resources at hand. Written by family physician Cynthia J. Koelker, MD, 101 Ways to Save Money on Health Care explains how to treat over 30 common medical conditions economically, and includes dozens of sections on treating yourself. Available for under $10 online, the book offers practical advice on treating: respiratory infections, pink eye, sore throats, nausea, diarrhea, heartburn, urinary infections, allergies, arthritis, acne, hemorrhoids, dermatitis, skin infection, lacerations, lice, carpal tunnel syndrome, warts, mental illness, asthma, COPD, depression, diabetes, enlarged prostate, high blood pressure, high cholesterol, and much more. This entry was posted in Antibiotics, Expired medications, Expired meds, Medical archives, Medications, Perennial Favorites, Preparation, Prescription Medications, Shelf life, Stockpiling medical supplies, Stockpiling medications and tagged Antibiotic, Chronic (medicine), Clarithromycin, Emergency Use Authorization, Erythromycin, Health, Infection, Oseltamivir, Pharmaceutical drug, Shelf Life Extension Program, Tetracycline, The Medical Letter on Drugs and Therapeutics. Bookmark the permalink. Thanks for the time lines on drug expiration. It doesn’t cost anything to hang on to your expired meds for an extra couple of years. If you never need it, great; but if you do, you will be glad you held on to it. Every time your doc writes a prescription ask for samples (my doc is generous with these), especially if you are starting a medication new to you. I do this because I would not want to pay for a full course of a medicine that I might not be able to complete due to some form of intolerance. But even if you can’t tolerate it, have it filled anyway…someone else may be able to use it very well in a TEOTWAWKI scenario. Recently, while getting treatment for a sinus infection, it was also time for me to have my 90 day meds reordered (he sends all his scripts electronically). While sending the antibiotic script to my local pharmacy he also sent it as a 90 day supply refillable x3. I didn’t realize this untill after I got home and opened the stapled together bag and was surprised to see a HUGE bottle full of (120) tablets. I must say I did have a twinge of “should I, shouldn’t I” – just take what I knew to be the prescribed dose and ignore the opportunity for refills. My concience lost the battle and I now have 24 ten day courses (23 after completing the original course) of a very wonderful antibiotic in a splitable form. I’m so ashamed of myself for doing this…NOT! You can pay cash for your medicines, don’t use your medical insurance. If you are on an expensive brand medicine, ask the doctor for a rx for a cheaper generic medicine. Many pharmacies have the cheaper meds on their $4 generic list, shop around and save. How can a person stockpile prescription meds? The pharmacist can’t give me more than a refill every 23 days up until the prescription expires. One cannot get very much ahead this way. Thank you.